Katie Mestayer is a senior at Zachary High School and is from Baton Rouge, Louisiana. She is in her second year of serving as her chapter’s FFA president and is involved in the National Honors Society at her school. She also serves as a youth minister to middle school girls at her church. 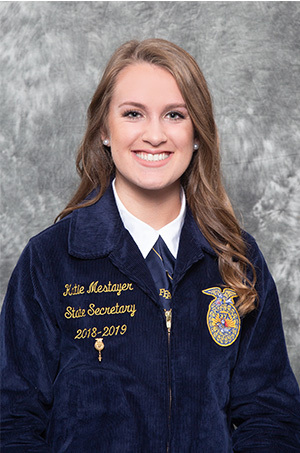 Katie has been an active member of her FFA chapter throughout her high school career and has participated in a variety of CDEs/LDEs, projects, and committees. Throughout her years, she has participated in the Floriculture CDE and placed state runner-up. She also participated in the Gulf of Mexico Public Speaking LDE and placed state runner-up as well. She focuses heavily on the Farm to Fork movement in her school and community by hydroponically growing vegetables and donating them to her school cafeteria and local food bank. Katie Mestayer is proud to serve as our 2018-2019 State FFA Secretary.